I want to love steampunk novels. I really do. The style is fabulous and so much fun. But the books I have attempted to read so far have mostly failed to impress. A few I've put down and not found the strength to pick back up. 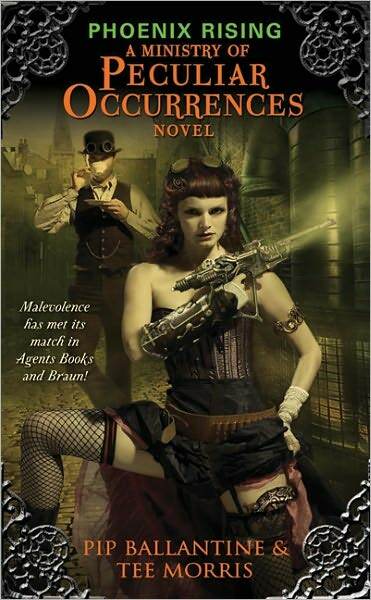 This one was at least quite good, but I've still not found a steampunk book to love here. The dialogue was a lot of fun, there were gadgets aplenty and some very good storytelling in places. The degree of action most certainly did not disappoint. Plenty of the characters were a lot of fun too. It had a lot of fantastic things going for it. And yet I still haven't found that steampunk series to love. The heroine, Eliza Braun, is possibly the biggest issue. The strong man, brainy woman trope has been taken and gender switched. To me that's not turning a trope on its head. It's becoming almost commonplace. It's a trope in itself. The degree of flamboyant feisty violence in full public view is fun but it just doesn't fly in the Victorian setting, fantasy or no. She'd be quite over the top even in modern settings. In a related problem, some of the devices feel like twenty-first century technology with gears glued on. Not all - some of the devices were great. But enough that it felt like a problem. Modern solutions to the problems - just with more brass. Also, an Australian called Bruce who speaks even more Ocker than Crocodile Dundee? From an Australian perspective I found this character jarring. He was at least a well fleshed out character, as were most. I found a couple of other issues, but... too spoilery. None of these problems were abandon-the-book or throw-against-the-wall bad but they did hold a good book back from being an excellent one. I'm undecided as to whether or not I'll read the next book in the series. With so many books I plan to read I'm not sure I have time to spend on a series that's less than excellent. However, if you're a lover of steampunk books this one is worth a read. If anyone wants to make steampunk reading suggestions, fire away! It might take me a while to get to them but I might just find that amazing author.